Hey, True Believers! Christos Gage here, one of the writers of Marvel’s Spider-Man, available exclusively on PlayStation 4 – and more than a few Spidey-related comics like the recent Spider-Geddon event which our web-slinger starred in. If you’ve seen all the Easter Eggs in the game, you’ve probably surmised that I, like the rest of the team, am a gigantic and longtime comic book fan. Which is why I was so excited by Marvel’s tease on January the 8th that the fabulous Fantastic Four are back in the spotlight – and back in Marvel Games – as part of Marvel’s “World’s Greatest Week.” To celebrate, we’ve been working with Insomniac Games to include some fantastic content, available in today’s patch 1.14 for Marvel’s Spider-Man on PlayStation 4! “But what do the Fantastic Four have to do with Spider-Man?” you may ask. Or maybe you don’t – because you know that Spidey has a long history with the Fantastic Four, going back to 1963’s Amazing Spider-Man #1, when our rookie wall-crawler tried to join the team – only to end up fighting them! That was just the beginning of many years of adventure (including the 2010 Spider-Man/Fantastic Four miniseries written by yours truly and drawn by Mario Alberti) that has led us to today, with the new Fantastic Four comic written by longtime Spidey-scribe and game story contributor Dan Slott. There have been too many cool Spidey/Fantastic Four moments to count, but one of the most memorable in their illustrious history was in Amazing Spider-Man #258, when Spidey swung by the Fantastic Four’s headquarters for help with the alien symbiote he was wearing as a costume (that’s right, it later became Venom). 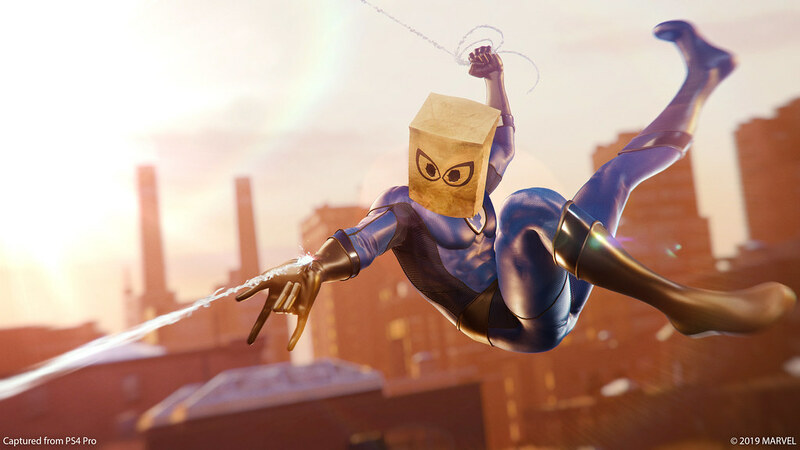 The Fantastic Four got it off, but then Spidey was left in his underpants (we’d never do something that silly in the game…wait, I’m being told we did). So Spidey borrowed a Fantastic Four costume…but they don’t have masks! So, to conceal Peter Parker’s secret identity, his frenemy, the Human Torch, gave Spidey a grocery bag to wear on his head. As The Thing might say, what a revoltin’ development! 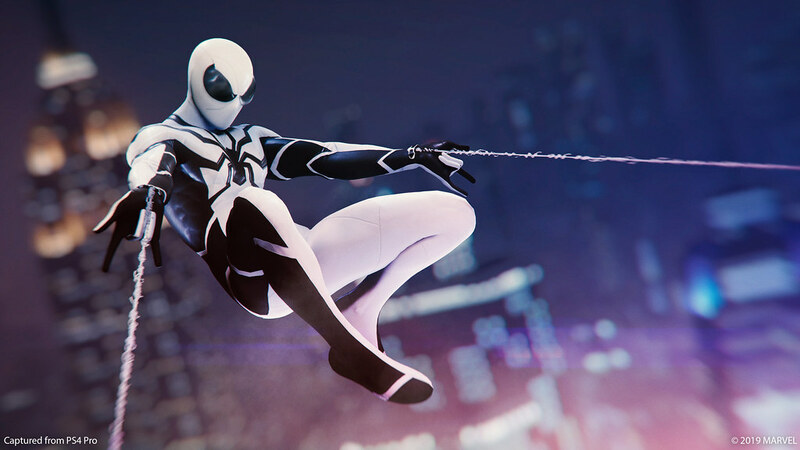 At 2pm Pacific today, you can check out Insomniac Games’ livestream where they will be playing the game with both of the new suits! Just go to www.twitch.tv/insomniacgames at 2pm Pacific.